One of the great things about music is you never know what‘s around the next corner, or the next click in this age of technology. 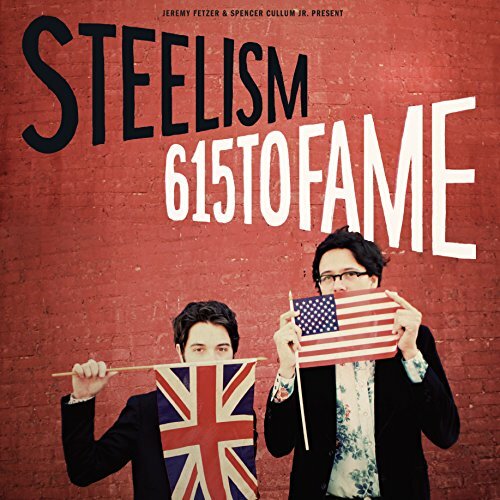 Steelism and their debut album ‘615 to FAME’ is one of those moments when one click revealed a gem. Formed by players from different continents, guitarist Jeremy Fetzer from Canton, Ohio in the USA and steel guitarist Spencer Cullum Jr from Essex, England the lads bonded while touring with Caitlin Rose and Steelism was born. It’s quite strange that Instrumental music seems to have been lost in the mists of time since the heyday of the genre in the 1950’s and 1960’s when such acts as The Ventures, The Shadows, and Duane Eddy ruled the airwaves. Steelism bring it back to the fore with an irresistible take on the genre that incorporates elements of country, surf music, soul and a love of film soundtracks. The album is named after the route from Nashville to Muscle Shoals, Alabama where half of the album was recorded at the legendary FAME studios. A great choice which I’m sure must have been highly influential in the resulting sound of the record. The album opens with ‘Cat’s Eye Ring’ and the scene is set as you are transported to the land of Clint Eastwood, tumbleweed and the genius of Ennio Morricone courtesy of the opening guitar figure. The title is a reference to the Battle of the Alamo in 1836 for the history buffs among you. The track features a lovely, almost classical, middle section that initially seems at odds to the whole but works perfectly. Surf devotes will love the infectious twang of ‘The Landlocked Surfer’ while ‘Marfa Lights’ might be the first instance of countrylectro as the duo expand over a backing track that harks back to the Germanelectro bands of the 1970’s. The album has more highlights aplenty with the ballad ‘Tears Of Isabella’ a more traditional country piece, which is reminiscent of the Marty Robbins songs I would hear my parents play in my youth. ‘Ladybird’ initially has an upbeat 60’s vibe that evolves into a slow blues workout with upfront bass; swirling steel and fluid lead guitar work. ‘Cuban Missile’ highlights the superb rhythm section of Jon Radford and Michael Rinne while the Andrew Combs co-write ‘China Plate’ displays impressive musical dexterity from the duo. This really is a quite wonderful record that makes repeated playback a necessity and a pleasure.